Which way is what? Looking up at the new wayfinding sign on First near Broadalbin. Strangers wandering around downtown Albany on foot now have handsome signs to tell them where to go. If they can see the signs, that is. Installation started this week of 20 “pedestrian/sidewalk” signs. It was about five years ago that the Central Albany Revitalization Area (CARA) advisory board first approved this “wayfinding” project as a way to enhance the downtown tourist economy. The initial budget was for $75,000. 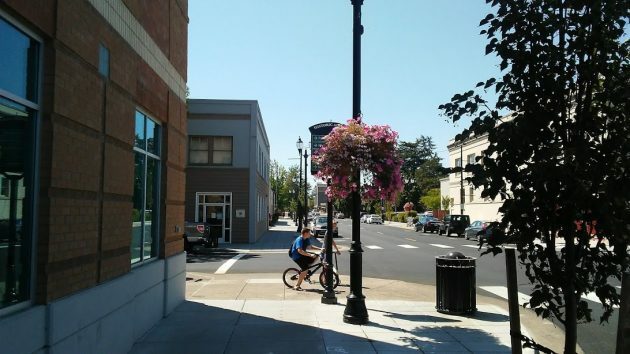 Eventually, in September 2017, the CARA board and the city council, as the Albany Revitalization Agency or ARA, approved a $100,209 contract with the Eugene Sign & Awning Co. to fabricate 27 wayfinding signs, 20 for sidewalks and seven bigger ones to be seen by drivers on the downtown couplet of Highway 20. This March, CARA allocated an additional $26,605 to get the signs installed. I hadn’t seen the signs until City Manager Peter Troedsson reported on the installation in a Thursday report to the city council. Friday I went looking and found at least three. High above the heads of people on foot, two of them were partially obscured by the luxuriant flower baskets the Downtown Association is kind to maintain. I’m also wondering about the directions given. One sign, on First in front of the soon-to-be vacant Wells Fargo Bank, points west to “restaurants.” There are a couple of restaurants that way, but there are more, and closer ones, in the opposite direction. When CARA was discussing this years ago, I remember a skeptic asking whether in the age of the ubiquitous mobile device, it made sense to spend money on overhead signs when every tourist under 75 walks around looking down at the maps and GPS directions on his phone. … when you get closer, you can see what the sign wants you to know. Why don’t we use local businesses to make our signs? It really irritates me that government doesn’t support local businesses who pay taxes which in turn pays the government workers wages. Eugene couldn’t care less about what happens in Albany. All local businesses were invited to bid on the project but the engineering specifications (wind load, etc.) made the Eugene company the closest one who could do the work. 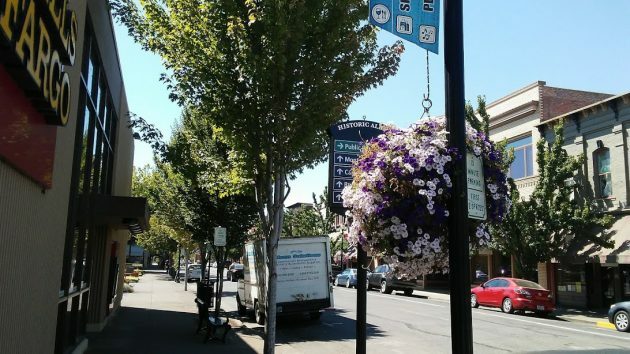 There were many businesses very far away who could have done it, but the city was glad to be able to choose an Oregon company. It is not surprising that CARA does not know which way to turn. CARA funds these signs using debt. The debt is paid back with property tax revenues skimmed from the overlapping tax districts (county, city general fund, education, 4H, etc.). The theory says the “investment” will return future tax revenues that wouldn’t have happened without CARA’s spending. So please explain – how does “investing” in signs increase the tax base of downtown private property? Answer – it doesn’t. In reality, the ROI from this “investment” is negative. The money should have stayed with the taxing district and paid for essential services. Tax revenues used to pay for signs that misdirect? The irony is heavy. I worked on cold startups for over 40 years. None came in exactly as planned. Adapting the plan to reality takes patience and skill. A fellow naned Dwight David Eisehhower once opined that plans were nothing, but planning was everything. The written plan began to fail with the first step. The mission succeeded because the boots-on-the-ground understand the intent and compensated for realworld conditions. A plan is an intended trajectory, not a sacred/inspired document. So glad to see the signs finally going up. 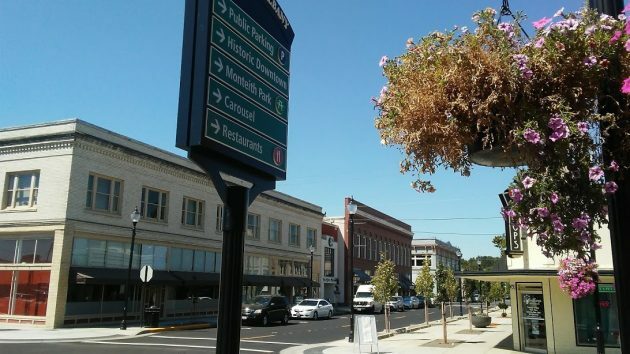 Luckily the flower baskets can be moved – that was the plan when the volunteers with the Albany Downtown Association (funded with grants and member dues) paid for and hung the 100+ very-heavy baskets last spring. Sign locations have been tweaked endlessly to meet different codes. The locations and types of businesses have also changed dramatically since the signs were proposed many, many years ago, so they were designed with the ability to switch-out the words and directions, as needed. Folks only interested in a restaurant will still consult their apps to find a cluster of them downtown, but the signs will be very helpful for the strollers and wanderers who finish their ride on the carousel and then wonder what other interesting things there are to do in Albany. Now they’ll know. Another unbelievable waste of money. The obvious solution? Ban strangers from Albany. Signage is moot. I hope it’s not churlish to ask commenters on this site to use complete sentences, or at least phrases that can be understood. Your pictures (as framed) make it seem like the signs are hard to see. Hidden by flower baskets and such. I’ll need to take a shopping stroll soon and see them for myself. Most likely on a trip to the post office. From your pics, they appear to be well done and style wise offer an air of enchantment. A busy and vibrant place!